IGF molded grating reduces installation and fabrication costs because it is lightweight and has bi-axial strength and stiffness. Full panels can easily be handled by two men. Unlike steel grating, which must be cut with a gas torch, IGF molded grating can be cut with a rotary saw. Because IGF molded grating has bi-axial strength and stiffness, it can be cut to complex curved shapes without adding extra supports. IGF molded grating is available in three resin systems for a wide range of corrosion resistant properties. IGF vinyl ester grating is our premium grade and has the widest range of chemical resistance. IGF isophthalic grating has an excellent chemical resistance including solvent resistance. IGF general purpose grating is ideal for mildly corrosive environments such as marine and waste water and is very competitively priced. Whether exposed to continuous submersion, splash, spills, fumes or gases, IGF molded grating outperforms steel and aluminum grating. 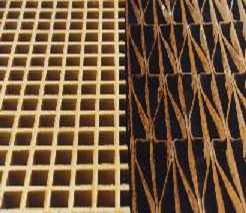 IGF molded grating is very flexible and may be repeatedly deflected without causing permanent deformation. 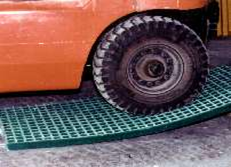 Once the load is removed, fiberglass grating will return to its original shape, unlike metallic grating which will remain deformed and require replacement. The energy absorption and flexibility of IGF molded grating makes it impact resistant. 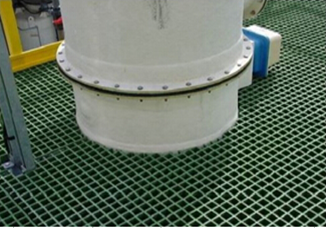 The slip resistant meniscus surface of IGF molded grating is created during the molding process by the formation of a concave cross-section on the walking surface. 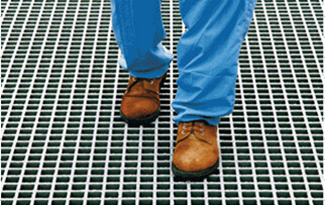 The no slip fiberglass grating has a coarse clear grit applied to the surface. Both the meniscus and no slip grit surface are safer than concrete or diamond plate, especially in wet conditions. International Grating & Flanges, Inc.